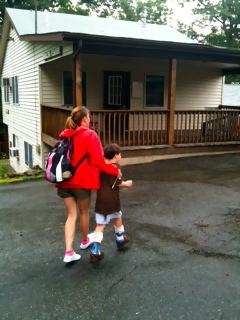 This afternoon, we dropped Max off at camp, where he'll be for a week. He seemed perfectly calm. Me, not so much. Right before we left, I heard something scratching inside the living room wall. Like some sort of creature. Unnerving, but I was too distracted by Max's departure to give it much thought. The camp could not have been more welcoming. Right off, his counselor bounded out to greet us. Kirsten's from Scotland (a lot of counselors come from abroad, including one who reads this blog) and seemed lovely and competent. She asked all sorts of questions about Max as I unpacked his clothes and made up his bed (purple bedding, of course), and didn't blink twice when I said that he likes all pictures he draws to have "Max eats spaghetti sauce" written across the top. I had been a little concerned that his assigned bed was smack in the center of the bunk, since he tends to like corner spots. But Max was more distracted by the fact that another kid had Thomas the Tank bedding. He attempted to rip off the purple "Max" sign they had posted above his bed and put it above that kid's bed, thinking perhaps nobody would notice the bed switch. Smartypants. Kirsten and Max took off for a walk. I met with one of the camp nurses and discussed putting on the day braces and his new, nifty purple night one (more on that this week). Sabrina volunteered to show how to put on the purple brace, because she's been dying to try it. Then I gave the nurse the scoop on the anti-seizure med Max takes twice daily, Trileptal. She asked what Max looks like when he has a seizure, and talking about it brought back the trauma of the two he's had in the last few years. So of course, I was even more jittery about leaving him. Next, I spoke with the camp cook. They did serve spaghetti with sauce as well as chocolate ice-cream, as I'd been promised, but no oatmeal (Max breakfast staple) or applesauce (Max snack staple). So off we went to the supermarket to pick up some and, bonus, I found blueberry applesauce that had a purple tint. I left Max playing a video bowling game. "Bye, Max," I said. He gave me a kiss and went right back to the game. He seemed perfectly content. I asked/begged Kirsten to email me photos, and then we were off. And I didn't even call the camp. For a whole two hours. Nobody picked up at the main number, so I left a message on the camp director's cell. No response. Eep. Meanwhile, we took Sabrina out to a nice Japanese restaurant, the kind of place we don't go with Max because they do not take kindly to BYO spaghetti. Then Sabrina wanted to rent that Justin Bieber movie Never Say Never from a Redbox, even though she's insisted she doesn't really like him since the day a couple of weeks ago when she casually asked Dave about getting the video. When we walked into the house, a few photos were knocked over from a table and a lampshade was askew. For some reason, I thought it was a bat. I made Dave walk all around the house. Nothing. I left a message with the exterminator. Then we settled down to watch Justin Bieber. I have to admit, I wasn't bored: The kid has charm and talent. Midway through I started wondering whether Max could be a rock star, that mind game I play, but no, he hates crowds. Although he does have the hair. Lightbulb! Max would look awesome with that Justin Bieber cut. I assume it's doable with a whole lot of gel. As the three of us were sprawled out on the couch glued to the TV, a SQUIRREL MEANDERED INTO THE LIVING ROOM. Like he wasn't sure he'd wanted to join us for TV night but had finally decided to come. "AAAAAAAAAAAARGH!" I screamed, or something like that. The squirrel scooted back to the kitchen. Dave took off after him. Sabrina jumped onto my lap and started wailing. "Don't cry, honey," I told her. "He likes Justin Bieber! He wanted to come watch him!" Then to Dave: "OPEN THE BACK DOOR NOOOOOOOOOOW!" A few seconds later, the squirrel did a lap through the living room, at which point I again screeched, "AAAAAAAAAAAAARGH!" or something like that. "He went out!" Dave reported from the kitchen. Then he walked in with our fruit bowl, which had been filled with green apples. The squirrel had chewed through most of them. Lovely. "You know why the squirrel came in here?" Dave said. "Because he heard Justin Beaver on TV and he wanted to come tell us he was a squirrel, not a beaver!" Dave told her, and Sabrina and I both cracked up. We have had some weird creature experiences in the last year—the dead birds, Maxsutawney Phil, the squirrel in the attic I got Dave for our 10th wedding anniversary—but I don't think anything beats a squirrel in your LIVING ROOM. As Justin Bieber croons "Baby, baby, baby, ohh" in the background. I made Dave look behind all the furniture for poop and/or another squirrel, just in case Squirrel #1 had a traveling companion. Nada. Then Dave drove off to deliver Max's iPad to his wonderful school speech therapist, who is helping us program some new stuff into it, and I took Sabrina for ice-cream. She was not amused when I asked if she wanted squirrel ice-cream. My cell phone rang as we downed our cones. 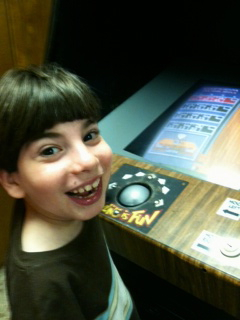 It was a counselor at camp calling to ask whether Max had two night braces. Nope, I said, just the one for his right foot. 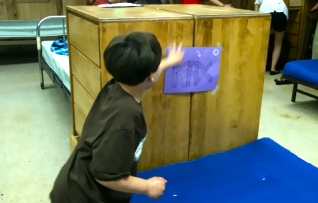 Max was doing great: He'd participated in activities all day, and was getting ready to go to sleep. I know it's crazy but I felt a little bad that Max missed the squirrel visit. It would have made him laugh hysterically. At the very least, the squirrel distracted me from worrying about Max. Now I am ensconced in bed and worried about squirrels taking over the house. I'd just like to draw your attention to another great camp, the Southampton Fresh Air Home. It's for kids with physical disabilities and I went for six years - the best six years of my life. It is absolutely the best place in the universe, and it really bonded me with other kids like me. The camp director, David, is pretty much the most amazing person in the universe. You can check out their website at http://www.sfah.org. I'm sure he'll have a great time! You are so lucky that Max has the option to go to a sleep-away camp! I'm in South Africa and even though we have excellent facilities for special needs children, there are no camps here yet. I would love to be able to send our Travis to camp for a week - he's on holiday for another two weeks and he misses having friends around terribly. That first day he's gone is crazy. But it sounds like he's in such good hands, and you're giving Sabrina the extra attention, and I'm so happy for all of you. I bet that Max will have a great time, and will be back before you know it. As for the squirrel, maybe a nice dog would keep them away. Just curious, do you pay out of your own pocket for assistance for Max??? Or do you have an insurance program?? or both??? I can't wait to hear more about his time AG camp. The squirrel was the perfect distraction for you all! I bet Max is having an awesome time. The one day years ago I came home and to find a there was a squirrel in my living room. It ran down the hall and scurried out through the drier vent hook-up! (I didn't have a drier yet) It had chewed right through a couple boxes of cereal. I later found some of the cereal stowed in my winter boots. I hope Max enjoys his stay at camp; I'm sure it'll be a blast! As for that uninvited guest of the rodent persuasion that you had at your house, I am glad he left without too much of a fight! Our neighbor downstairs often deliberately leaves bread and/or food outside in the backyard and often leaves her door wide open when it's really hot - and I am waiting for the day a squirrel - or something bigger - comes trotting into HER living room! I have to say, the Southampton Fresh AIr Home looks absolutely amazing. Anyone in the tri-state area, go check out the site. Thank you for sharing that! Tooner, our insurance pays for some therapies, we pay out of pocket for some. I have been thinking about Max all day long. I am sure he is having a good time, Sabrina had the best day, but things don't feel right without him. It's definitely wildlife season - we had a raccoon in our attic, but managed to get a professional to trap it; and best of all, we managed to keep it a secret from the one kid who would have been freaked out by it. The guy from the pest service carried it out the door not 8 feet from where my daughter was sitting, and she didn't even look up from her iPod! That's service. Hooray for camp! I used to work for a camp for kids and adults with disabilities, and before that was a Girl Scout Camp counselor working with special needs kids among others. So your blog made me very nostalgic! Especially about the spaghetti special diet. Definitely not the most unique diet I've heard of - sounds really normal for camp. I hope Max had a really good time and wants to go back. It's such a growing experience for campers (and for their families). I just discovered your blog but i love it already. I laughed so hard at your husband's "Justin Beaver" joke because I spent five minutes the other day explaining to some very shocked first graders girls that they had been saying his name wrong.